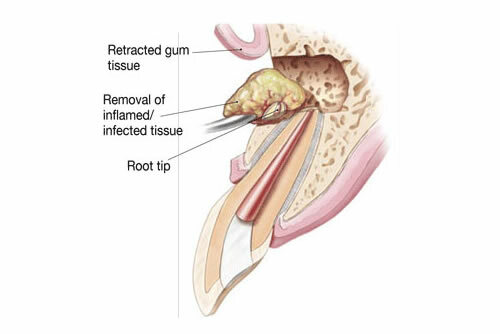 An Apicoectomy is the removal of the root tip and the surrounding infected tissue of an abscessed tooth. This procedure may be necessary when inflammation and infection persists in the area around the root tip after root canal therapy. Local anaesthetic will be used to numb the tooth and area around the tooth, then the gum is lifted to uncover the underlying bone and the root end of the tooth. The root apex (tip) is cut off and all the infected tissue around the root tip will be removed. A filling is placed to seal the end of the root canal, the gum is repositioned, and sutures are placed to hold the gum tissue back in its place until healing occurs. After a few months, the bone around the root-end has healed, and all symptoms are gone.